Six Sigma is a great method to improve the quality and efficiency of processes by streamlining them. Firms that have adopted this method, such as Motorola and General Electric, have attributed savings worth billions of dollars to the implementation of Six Sigma. Like Lean and Kaizen , Six Sigma is also striving for the optimization of processes and, thus, performance and quality improvements. Six Sigma achieves this by eliminating defects and variations within a process. The method was developed by Motorola in 1986 and uses statistical analyses and data to quantify process improvements. This is where Six Sigma differs from Lean or Kaizen. Unlike Kaizen, it is much more than just a mindset and unlike Lean, it identifies the root cause of inefficient processes differently (due to variations within a process instead of unnecessary steps). 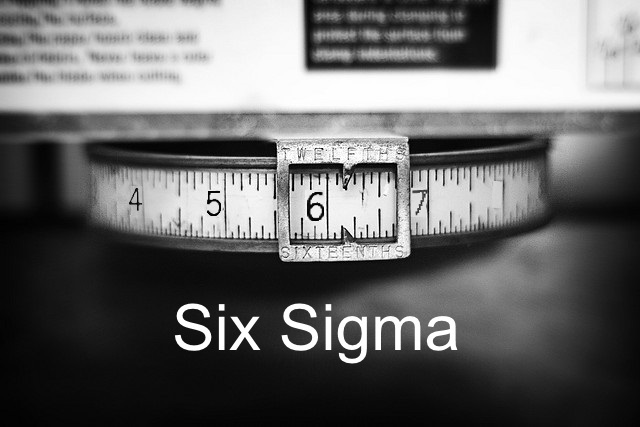 Why the name “Six Sigma”? In manufacturing, you can measure how many defect-free products were produced by a “sigma” rating. Six Sigma (sixth sigma level) is almost reaching for perfection because it describes a process that basically strives for a 99.9% defect-free production. If you want to implement Six Sigma into your corporation you need to be aware that it’s a commitment. Which means that once you have committed to it you need to stick to it and give it your all. This will sound familiar to those who know Scrum and Martial Arts. In Six Sigma there are also clearly defined roles. People in the organization who hold a specific role, are experts, who have received extensive training on the Six Sigma approach and are responsible for the successful implementation of it. They’re the executives who lead Six Sigma projects and choose the “belts”. They are responsible for the whole undertaking and also make sure that there is support for the project in the organization. Just like in Martial Arts, there are different levels of belts. The highest level is the Master Black Belt who is an expert of Six Sigma methods and is also a great leader and PM. Their role is to instruct and lead the other belts. They are basically full-time Six Sigma coaches. Black Belts can be compared to leaders of a particular project and are responsible for executing it. Green Belts are not primarily working on Six Sigma implementation, but take it on as an additional task to their ‘normal’ responsibilities. There are 5 steps in the Six Sigma process. It is important that this sequence of steps is followed if you want to benefit from the Six Sigma approach. Motorola originally developed Six Sigma for manufacturing, but just like other management and process optimization approaches, it can also be applied to PM. If they are so similar, then why would you need to implement Six Sigma into project management? The answer is that while PM has metrics to measure the success of the project itself (e.g. ROI), it has no means to measure and quantify improvements made to the project’s process. This is where Six Sigma comes in. It provides a statistical method to measure performance and tools to analyze where the PM can improve processes. Optimize Your Processes with Six Sigma - InLoox • Copyright 1999-2019 © InLoox, Inc. All rights reserved.